St. Agnes church was nice enough to allow us to come into their church and take First Communion Photos. This little boy was dressed in a white suit and was so adorable and willing to take the time to capture this special moment in his life. 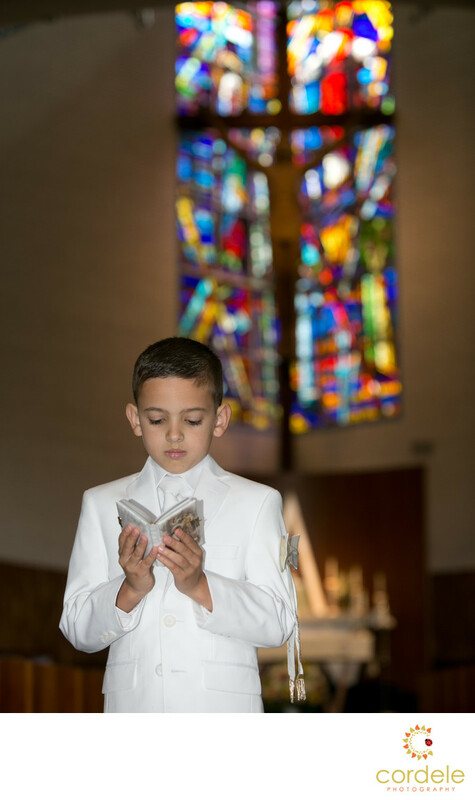 First Communion Photos are a child's first real exposure to being part of the catholic faith. While they are all baptized by this point, they don't remember it and this is one of the first events in a child's life that they will remember. For this photo we went into the church, and I was on the ground of the center aisle. I wanted to be sure to get the stain glass window in the back with the crucifix in the background. I didn't want to make it the focal point so I made sure to shoot at a lower F stop and hit Ben with a little bit of flash.